KUALA LUMPUR (Nov 4): The FBM KLCI declined 5.98 points or 0.3% to 1,847.36 points in line with weakness in regional markets. The KLCI's decline came on losses in oil and gas counters, besides plantation stocks. These included SapuraKencana Petroleum Bhd and Kuala Lumpur Kepong Bhd. From a technical viewpoint, MIDF Research analyst Syed Muhammed Kifni told TheEdge Markets.com that the KLCI had encountered overhead resistance. “Technically speaking, we reckon the index is now facing overhead resistance, which entered the market at the 1,855-1,440 points level before the October downswing,” Syed Muhammed Kifni said via email. Across Bursa Malaysia, a total of 1.7 billion shares worth RM2.1 billion were traded. 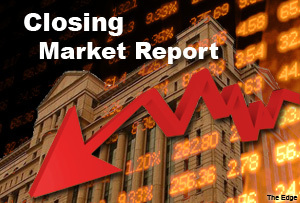 Market gainers trailed decliners by 378 versus 438, while 308 counters were unchanged. The top gainer was MISC Bhd while the leading decliner was British American Tobacco (M) Bhd. The most active counter was Efficient E-Solutions Bhd. Asian stocks dipped on Tuesday with latest signs of slower growth in China and the euro zone dampening the mood, although Japan bucked the trend and rose to new seven-year highs on follow-through momentum generated by the Bank of Japan's surprise stimulus move last week, according to Reuters. The Nikkei 225 ended 2.73% higher. Malaysia's ringgit traded at RM3.3305 to the strengthening US dollar, the weakest in eight months. The ringgit has weakened to current levels from RM3.1463 on August 27 this year.